Although we’ve been home for more than a week it has taken a little while to settle down to writing and we have had the distraction of family visiting as well – that’s enough excuses! We thoroughly enjoyed our trip and have many treasured memories, not always accompanied by a photo! The following are a few of my favourites. I can’t take credit for these photos or for finding the snake but I can tell a story to go with them. 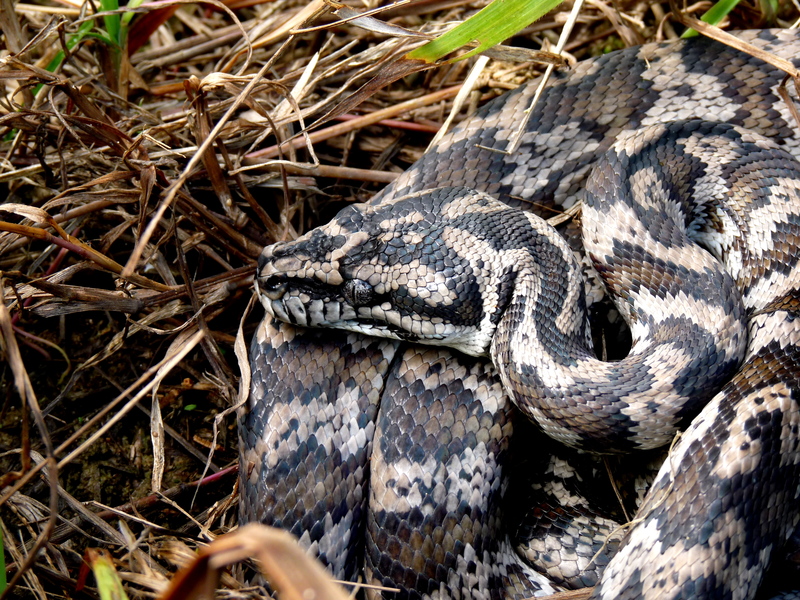 This lovely Carpet Python was keeping warm in a sunny patch well hidden in long grass along the edge of our newest wetland system. 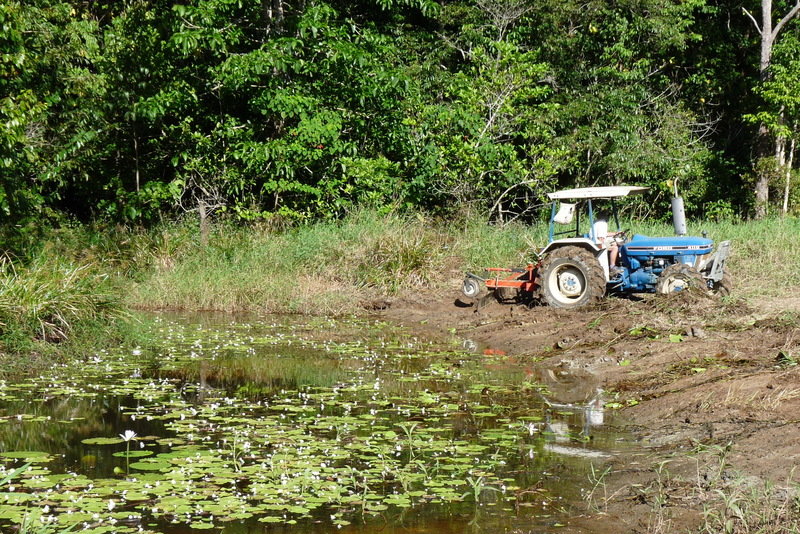 Although we have a lot of natural regeneration of trees and smaller herbaceous plants around the edges of the wetlands it is necessary for us to control the weeds which take every opportunity to multiply. 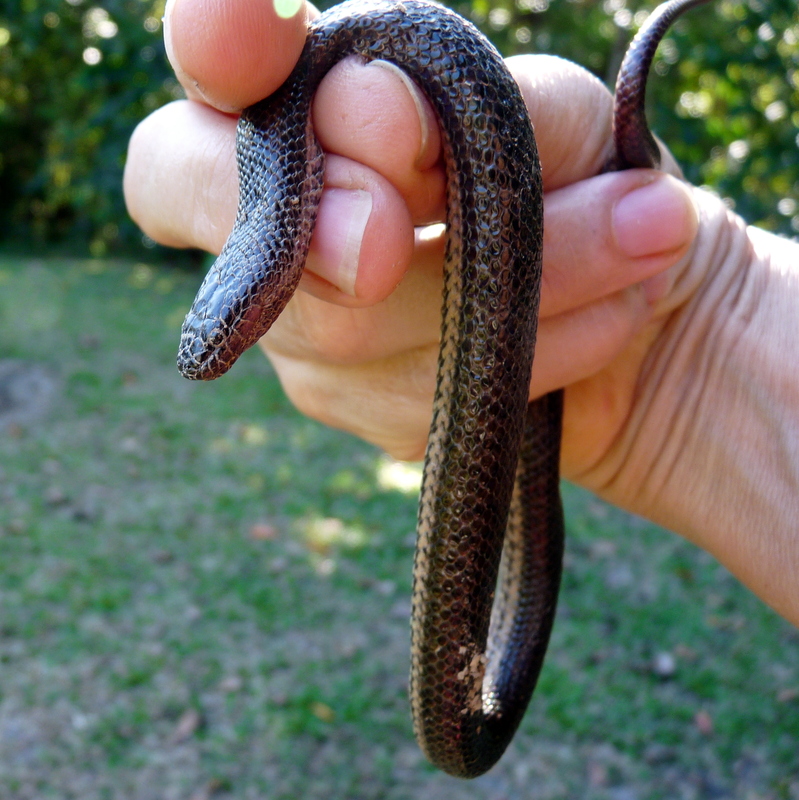 Allen was using a cane knife to cut down some clumps of Guinea Grass (Panicum maximum) – the species name gives you a clue about its potential size – and luckily he works carefully keeping an eye out for sheltering creatures so he saw the snake before it was in any danger. If you look carefully in the last photo you can see the bulge – of what we are not sure – which we presume was the snake’s most recent meal. 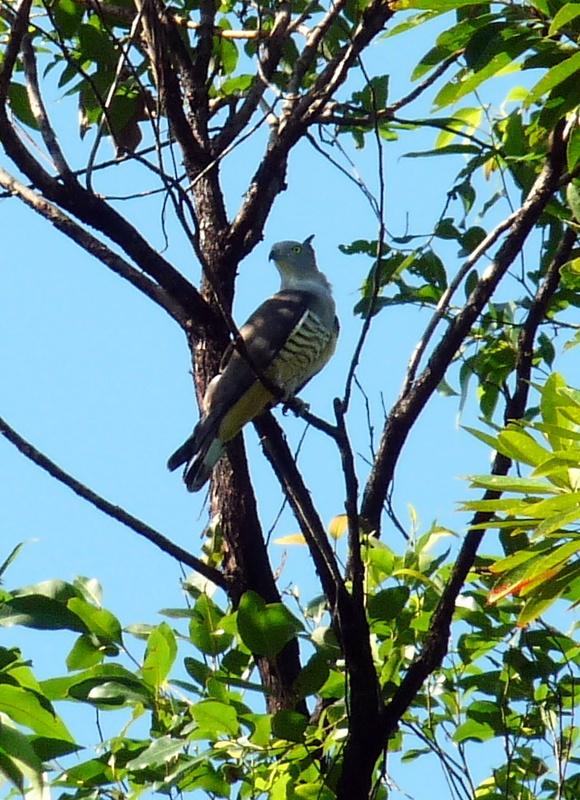 After taking the photo Allen pulled some dead vegetation over the snake in the hope that the Whistling Kite wouldn’t spot it as it made one of its regular sweeps over the property. 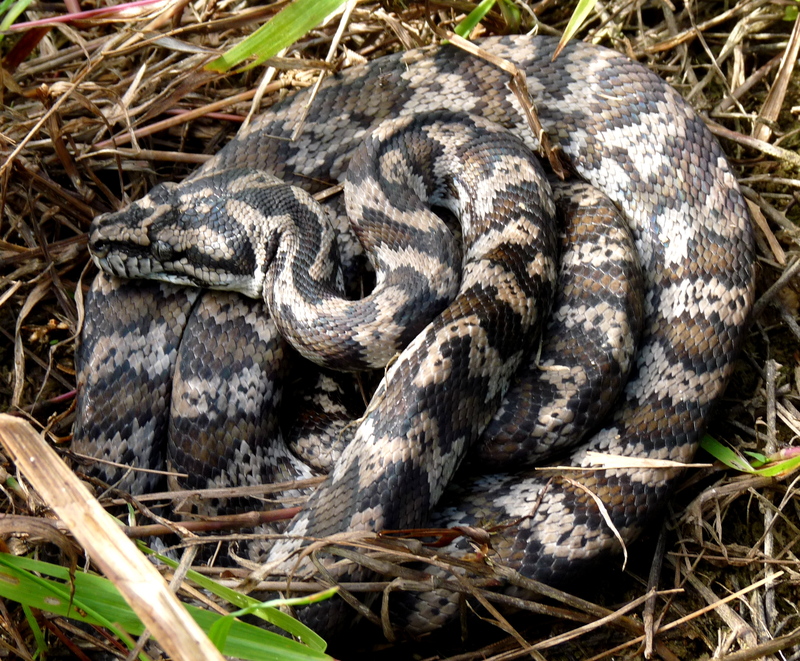 The snake was in the same place later in the day so it doesn’t seem to have been too put out by the camera’s brief intrusion into its post prandial basking in the warmth. 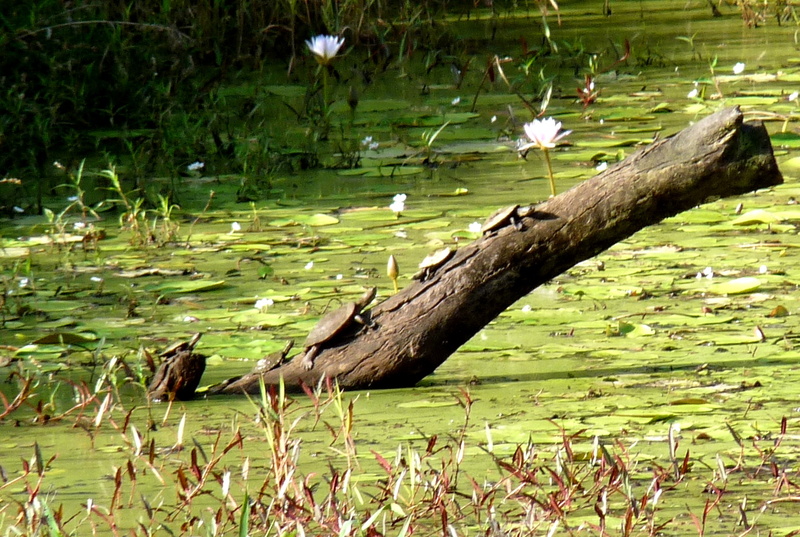 So how many turtles can sit on one log? Again I can’t claim accolades for the photograph but it goes with the ‘warmth’ theme. The photo of these Saw-shelled Freshwater turtles was taken from some distance away in order to capture the group before they spotted the photographer and plopped into the water. 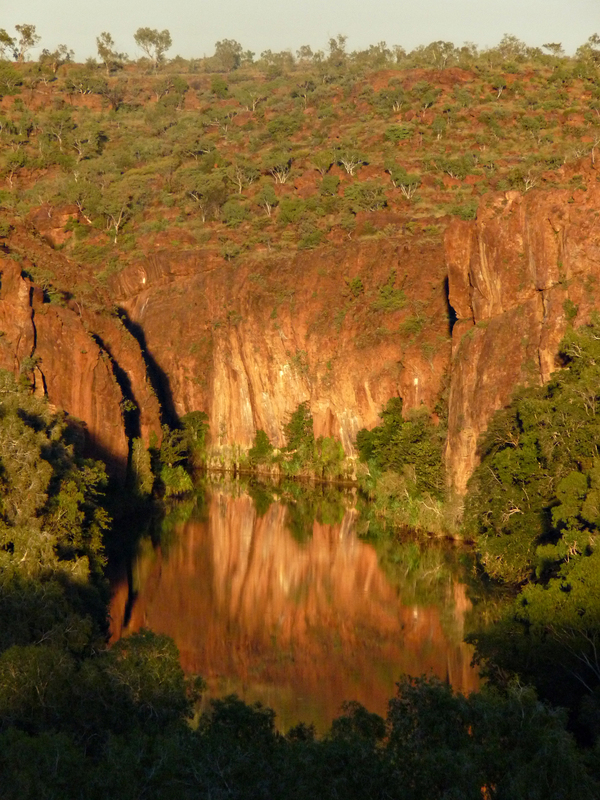 Towards the end of the ‘wet’ we often experience extended periods of drizzly rain but now we are happily enjoying some clear, starry nights and beautiful sunny days. Although cool, the evenings are quite pleasant as long as we remember to put on some extra clothes and to close all the doors to keep in some of the day’s warmth. 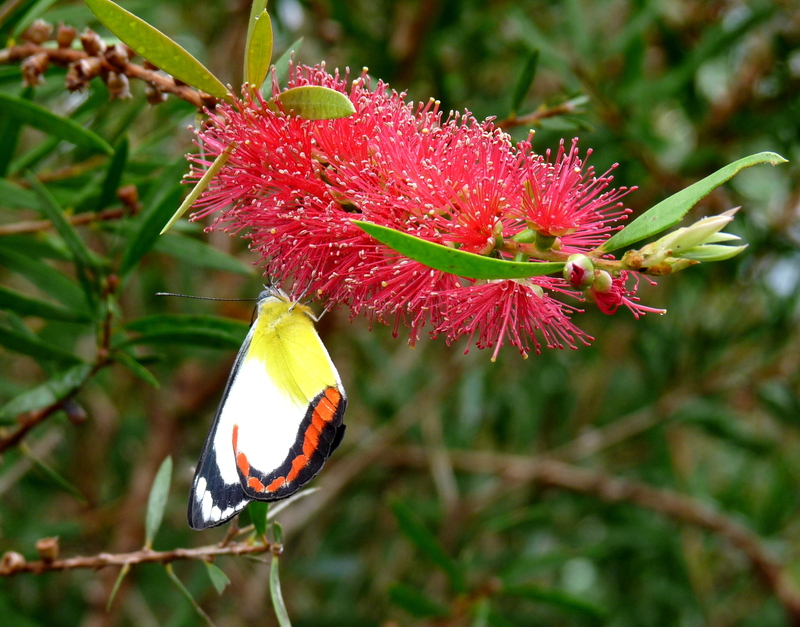 Butterflies have been busy feeding on flowering Callistemon – a good height for some photos unlike the Melaleucas which are also very popular with the nectar lovers but too high for me to get a good photo. 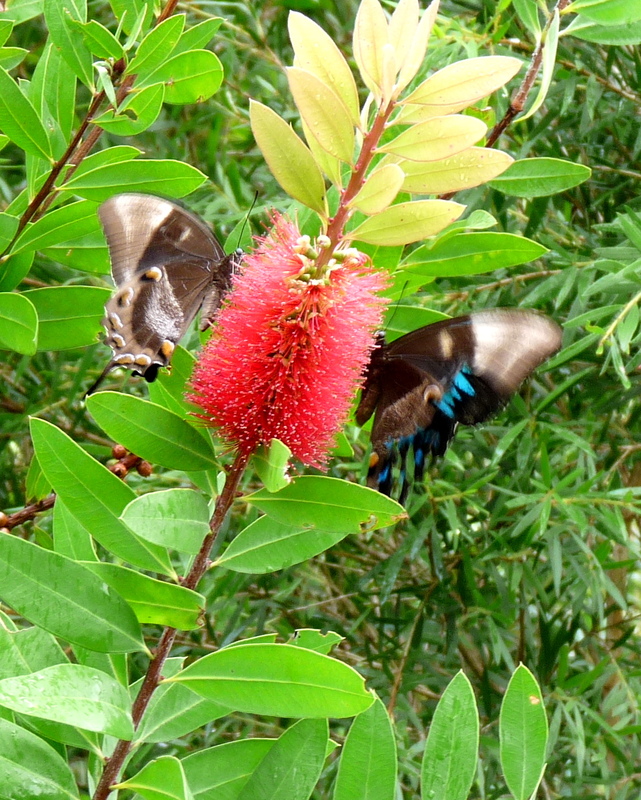 Both Melaleuca and Callistemon flowers are constantly visited by birds and butterflies during the day and Spectacled Fruit Bats feast on the Melaleucas at night. Even though this photo could have been sharper I can’t resist including it because I was so pleased to have two Ulysses in the one shot! The host plant for Ulysses is Corkwood (Melicope elleryana) a fast growing Rainforest tree which we often include in our revegetation work. The larvae of Union Jack butterflies (Delias mysis mysis) feed on the broad leaves of a red-flowering Mistletoe according to Common & Waterhouse. Although Mistletoe is a parasitic plant it provides a good source of nectar and so we don’t make much of an effort to discourage it especially as it often flowers when there is little else available. 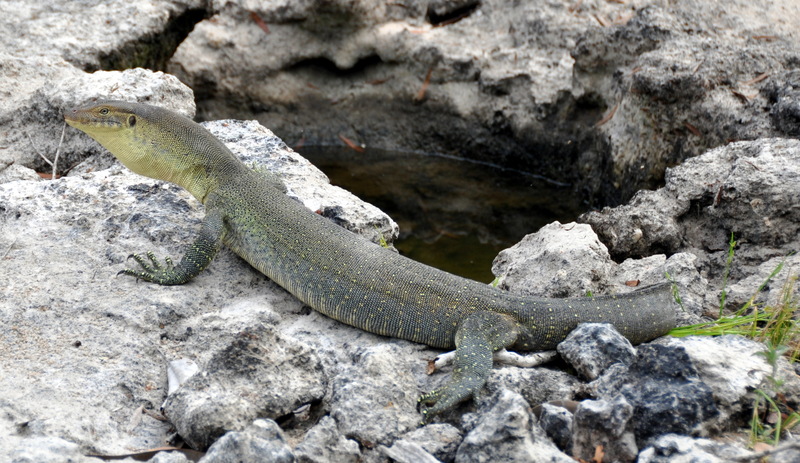 Now that the days are cooler the cold-blooded creatures are being seen a little more frequently as they make the most of any patches of sunlight. 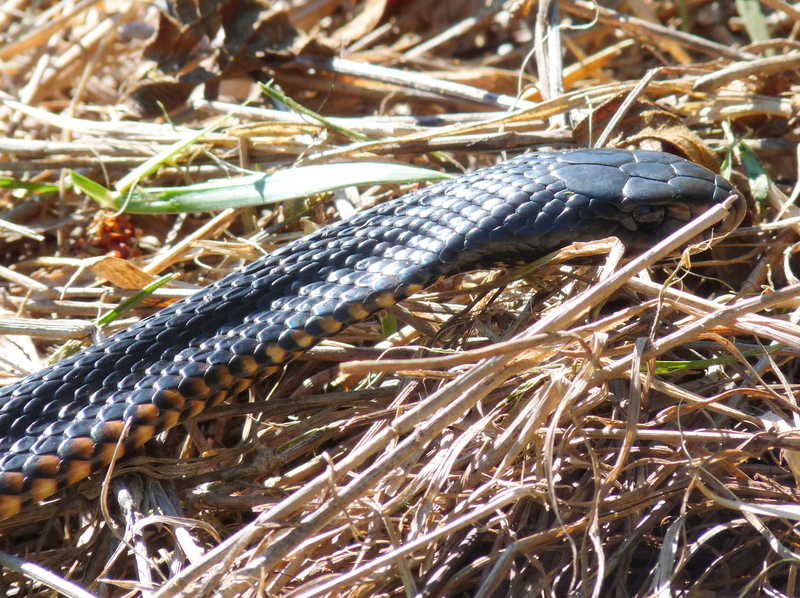 I disturbed this young Red-bellied Black Snake (Pseudechis porphyriacus) which was lying quietly on some dead grass until I walked down the hill concentrating on the water ahead of me and not watching where I was going. When I heard a movement on the grass I saw that I had disturbed this poor fellow but managed to get a quick photo before he slid off into another pile of mulch. 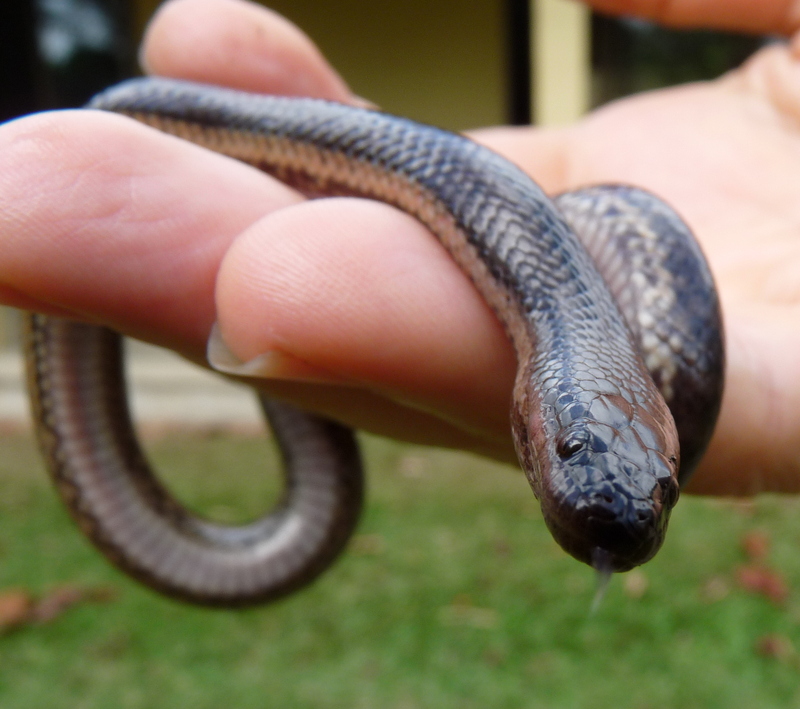 Although they are a venomous snake we don’t consider Red-bellied Blacks a threat to our safety. Like most snakes they would prefer to keep out of our way whenever possible. 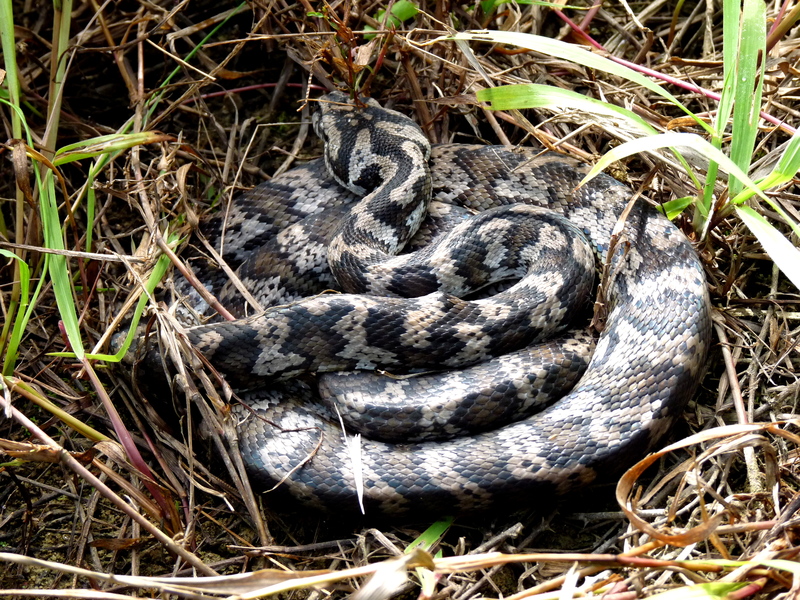 It appears that this snake has attempted to make itself look bigger by flattening out but I think it looks like it needs a good feed! Scattered showers and thunderstorms are frequently forecast at this time of the year and although it is often too wet to work outside sometimes the showers are scattering in other areas of the tropical north so we have enough fine weather to do a few outside jobs. Our main focus at this time of the year is on planting and we are nearly at 1,000 trees for this season – this includes a special planting in December to celebrate our family gathering. This python has been enjoying some of the many frogs that inhabit our wetlands as well as helping itself to the eggs laid by the Bush Stone-curlew.